Love panini? 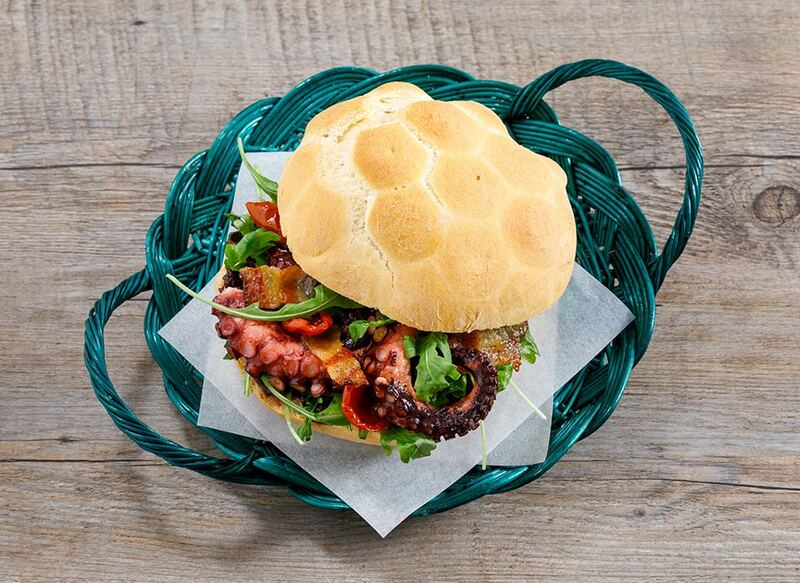 Here's a delicious seafood panino with an amazing flavour, easy to make using the oil-cooking method! Prepare the octopus in oil at least half a day ahead. Wash the octopus under running water, gut it and remove the beak and cut it up, leaving the tentacles intact. Place it in an airtight jar with a bay leaf, a clove of garlic and a few peppercorns. Cover thoroughly with Zucchi Dolce Fruttato extra virgin olive oil, close the lid and place it in the oven preheated to 130° then cook for 2 hours and 30 minutes. Turn off the oven and wait for the jar to cool, leaving the octopus in its oil. Make the pâté. Rinse the brine off the olives, peel half a clove of garlic and blend these two ingredients in the blender. 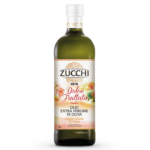 Dribble in about half a glass of Zucchi Dolce Fruttato extra virgin olive oil while blending, until the mixture is smooth and creamy. Add salt and pepper to taste and transfer to a bowl. Turn on the grill of your oven. Cut the "guanciale" into strips and place it in an oven tray lined with greaseproof paper. Bake for a few minutes to make crispy wafers. Put the panini in the oven with the "guanciale" to warm them. Cut the panini in half and spread the inside with a spoonful of olive pâté. Place a few leaves of arugola, a couple of octopus tentacles, a few cherry tomatoes and crispy "guanciale" wafers on top. Put the top on and serve at once.